It’s always exciting to see something you’ve designed and been working on in the ethereal, electronic world transformed into something real. Going from mockups to an actual website delivers some of this buzz, but for me nothing beats seeing something you’ve designed become physical – like a business card or a badge. Having been involved in both advertising for the MoR Brewing Company and for the 2013 Alba Real Ale Festival it was only fitting I should attend the festival and sample the beers. 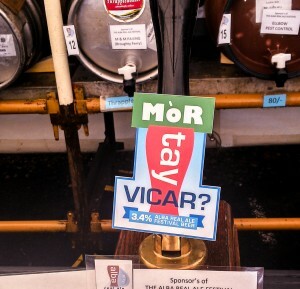 The official festival ale was supplied by MoR Brewing and I designed the pump clip for “MoR Tay Vicar”. (Apologies for the poor photo – it was the best I could manage with my mobile phone when half cut, holding a pint in the other hand!) The design incorporated the festival logo and the MoR logo. The beer wasn’t bad either!